To-date, The Fifth Element, is hands down Luc Besson’s most accomplished film. The story is extremely compelling and interesting, the cast blends perfectly with the amazing sets and action, and even though it had a mixed reception when it opened in 1997 it has come to be loved the world over. With Luc Besson's Valerian and the City of a Thousand Planets coming out later on this month Sony Entertainment has released two of his critically acclaimed films Leon: The Professional and The Fifth Element on 4K UHD Blu-ray timed to concede with the new release. For those who are yet unfamiliar with The Fifth Element, the film, celebrating it's 20th anniversary this year, is about Korban Dallas (Bruce Willis; Die Hard) a New York City taxi driver who is thrust into the battle between good and evil that has been raging on for thousands of years. He, along with The Fifth Element (Milla Jovovich; Resident Evil), a priest (Ian Holm; Alien), and the worldwide government heads, must try to stop the ultimate evil, Mr. Shadow, and his Corporate War Monger, Zorg (Gary Oldman; The Dark Knight) from destroying the world. During our time in the world of The Fifth Element we are introduced a very eclectic group of characters, aliens, and objects that have never graced the silver screen included the warfaring Mangalores, the peaceful Mondoshawan, a flying boat that delivers Chinese food, an opera-singing diva alien named Plavalaguna, and the hilarious/insane Ruby Rhod talk show host played by the always funny Chris Tucker (Friday). The Fifth Element was released during the height of French director Luc Besson (Leon: The Professional) career during the 90s. His style of combining unique European elements of filming with the action sensibility of American films put this film in a class of its own. Every time one watches this film you see something else that you missed the last time around. Whether it is a background element in one of the amazing set pieces/costumes by famed French designer Jean Paul Gaultier or some other part of the film, there is always something new to discover and enjoy. Aside from amazing directing and designs of The Fifth Element The film's actors give performances that are rarely found in science fiction/action films from the 1990s. Bruce Willis gives a three-dimensional performance instead of just the normal one-dimensional shoot first and give a one liner that audiences were used to in the 1980s and 1990s. Mila gives probably her best performance that has ever graced the silver screen. She provides a commanding presence to Leeloo and well as a deeper venerability one has yet to see in any other role she has ever had. The rest of the supporting cast gives give performances as well that can also be put up there with their best works to date. The 4K UHD disc boasts a HEVC 2160p transfer that truly takes full advantage of the dynamic range offered by this film. The bright colors found in the Fifth Element never looked better. Jean Paul Gaultier's contributions to the film shine brighter and better than ever before. Blacks are spot on, and the sharpness and quality has never looked better (even on the screen back in 1997). The only downside to the transfer is that it contains quite a bit of film grain that could have been easily halved using digital noise reduction techniques. The audio, presented in Dolby Atmos, is exceptional. The audio tracks are separated out perfectly. The dialog coming through loud and clear, but it doesn't overpower special effect channels. The explosions and gunfire are remixed with such accuracy one feels like you are in the middle of a battle during certain times of the film. Most of the special features found in the package have been previously released on the original transfer of the film and are in standard definition. These include The Visual Element, The Star Element (showing casing actors Bruce Willis, Milla Jovovich, and Chris Tucker), The Alien Element (featuring the alien Mondoshawans and the Mangalores), The Fashion Element (the look of the film and it's fashion designer, Jean Paul Gaultier), The Diva ( a look into the Fifth Element's opera singer and her musical number) , and Imagining The Fifth Element. Aside from these features, there is also a brand new featurette filmed in 4k UHD with director Luc Besson looking back on making the film twenty years ago. To-date, The Fifth Element, is hands down Luc Besson's most accomplished film. The story is extremely compelling and interesting, the cast blends perfectly with the amazing sets and action, and even though it had a mixed reception when it opened in 1997 it has come to be loved the world over. One can only hope that someday in the future Luc Besson resists this world and creates the second film that he has been teasing ever since 1997. 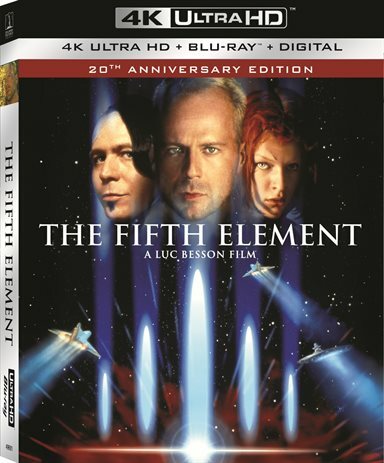 Download The Fifth Element from the iTunes Store in Digial HD. For more information about The Fifth Element visit the FlickDirect Movie Database.